Shillong Lajong FC displayed a stunning show in today’s grand finale of the Meghalaya Invitation Football Tournament 2016 and emerged as champions after defeating 58 GTC Boys by a margin of 5-0 at the SSA Ground Polo. Lajong were also the champions of the Meghalaya Invitation in the last two editions that is in the year 2010 and 2011. The tournament kicked off again after a gap of four years and Shillong Lajong completed its hat trick of wins. Lajong were a dominant force today and owned the game whereas GTC had very less chance to take control of the game and conceded five goals in total by a young Lajong side in the very exciting grand finale. The first chance of the match fell to Lajong when Bipin Singh took a shot from outside the box in the 5th minute but the GTC keeper saved it from entering the back of the net. In the 24th minute of the game, the Reds got another good chance to take the lead but Alen Deory’s shot from inside the box went just a few inches wide.Then finally in the 27th minute, Redeem Tlang scored from a Pritam Kumar cross to give Lajong a 1-0 lead. Thangboi Singto’s boys were making several good moves up front and kept on adding immense pressure on GTC. They also played a very good passing game and made excellent crossing deliveries too. Although, the score line was 1-0 in the first half Lajong came back in the second half even stronger than GTC could have imagined.They Reds looked extremely dangerous on many occasions and added four more goals in the second session. Even though GTC started the second half brightly with back to back chances to level the score, it was Lajong who more clinical in attack. In the 48th minute, Alen Deory received a long ball from Jacob and the former makes a quick run inside the box and slotted the ball home to give his side a 2-0 lead. Six minutes later, Redeem Tlang completed his brace. Isaac who was inside the left side of the box, passed the ball to Redeem Tlang, who then tapped it in and made it 3-0 for Lajong. Redeem Tlang successfully completed his hat trick as he scored from inside the box in the 63rd minute and Lajong were then leading 4-0. For GTC boys, they had a big mountain to climb and they knew it was impossible to make a comeback as they had already conceded four goals. In the 87th minute, Bipin Singh also found his name on the score sheet when he netted with his left footer from inside the box and gave the Reds a comfortable 5-0 lead. 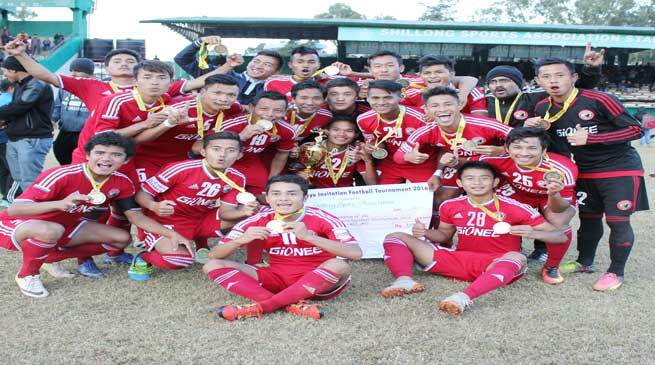 After a brilliant 90 minutes played by Shillong Lajong FC, the referee blew his final whistle and Lajong were crowned champions of the Meghalaya Invitation and also remain undefeated in the tournament. The team had a great year as they won the Bodousa Cup in Assam, the Gionee Shillong Premier League 2016 for three consecutive times and then ended the Shillong football season as champions of Meghalaya Invitation Football Tournament.